Connect with fellow obsessives through monthly, online cookbook clubs. The only requirement for membership is to be a kindred collector. Let's cook along! 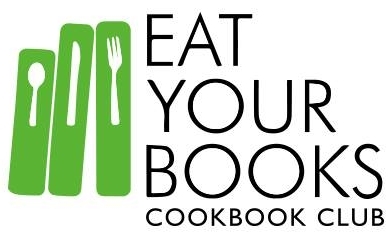 Eat Your Books is the definitive community for cookbook lovers. Their website offers a place to keep track of your own collection, recipe indexes (I love finding recipes based on my refrigerator contents), latest cookbook news, and reviews of thousands of books. The group is moderated by Jenny Hartin, and typically offers a main selection, alternate, online, throwback, and baking options—plenty to keep you busy each month. Most community interaction takes place on their Facebook group, including voting for future selections. Some member photos are reposted on their Instagram page. Selections have been a good mix of new, beloved classics, and also offer options for those that prefer to find recipes online. To participate: Join the Facebook group to post your photos and comments, or post to Instagram using hashtag #eybcc, most activity seems to happen on Facebook. Also, note content posted to the Facebook Group my be reposted to Instagram or shared in Jenny’s monthly cookbook club roundup on the Eat Your Books blog. Food52 has become the go-to source for all things food and cooking. Their website contains thousands of recipes, competitions, a home goods shop, plus they are cookbook creators themselves! Monthly selections are voted on by members through their Facebook group. Two books are offered monthly: a monthly main selection and a secondary annual “Bonus Book” for members to cook through all year long. Bonus book selections have tended toward the seasonal (2018’s book is Six Seasons by Joshua McFadden, 2019’s book is Sunday Suppers at Lucques by Suzanne Goin and Teri Gelber). To participate: Join the Facebook group and post comments and photos there. Also post to Instagram using hashtag #f52cookbookclub. In response to enthusiastic interest within the Food52 cookbook club group the Food52 Baking Club was born, offering a sweet selection to cook from each month. Books are voted on by members and tend toward newer releases, with an annual “Bonus Book” for members to cook through all year long. To participate: Join the Food52 Baking Club Facebook Group and post comments and photos there. Also post to Instagram using hashtag #f52bakingclub. A Instagram based cookbook club moderated by cookbook fans Bebe Black Carminito (freelance food stylist and recipe developer) and friend Rebecca Bloom (Paris trained chef and food writer). Selections are nominated by participants and voted on quarterly. To participate: Post to Instagram using hashtag #getcookingcookbookclub and also tag moderator @champagneandcookies. April: 1 year anniversary! Cook through any of the previous selections! Created and led by Deborah Balint (editor at The Feed Feed), the Rainy Day Bites Cookbook Club earns the distinction of being the longest running Instagram based cookbook club. Selections are typically recent releases and sometimes include baking or dessert titles. Deborah actively cooks from the book herself and has amassed a very active community of participants. Twice monthly challenges are announced at the beginning of the month where participants all cook the same recipe, and post on a pre-determined day. The community interacts on Instagram. Post using hashtag #rainydaybitescookbookclub and tag @rainydaybites. To participate in the two monthly challenges check out the @rainydaybites account and find details in the first post of the month. Saveur Magazine has been a respected reference of regional and global cuisines for decades, offering an authentic look at cooking around the world. Their cookbook club is led by three editors (associate digital editor Katherine Whittaker, senior associate editor Alex Testere, and test kitchen manager Kat Craddock) who each take turns selecting the monthly cookbook and moderating the group. Selections are widely varied with titles old and new, representing many international cuisines. Tasting Table is a website and newsletter for “epicurean obsessives” covering all aspects of culinary interest — food news, restaurant reviews, recipes, and cookbook club. Selections range from classic to contemporary. To participate: Join the Tasting Table Cooking Club Facebook group to post photos and comments, or post to Instagram using hashtag #ttcookbookclub.